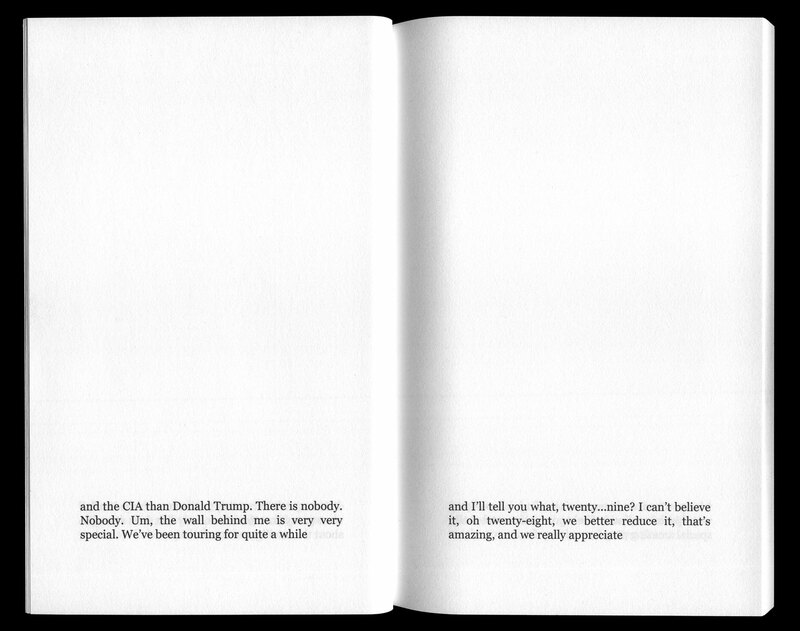 This book is my complete transcript of President Trump’s address to employees of the CIA the day after his inauguration. To keep in style, the text is cut into bits of 140 or fewer characters. You can find a digital version here. B&w digital printing, paperback, size 12.5 x 19 cm, 96 pages. See more images here. Also see my related book Enduring Freedom. The Poetry of the President. The book was nominated for the Prix Bob Calle 2019 by Lilian Landes from the Bayerische Staatsbibliothek and Rüdiger Hoyer from the Zentralinstitut für Kunstgeschichte. A chilling new book from Elisabeth Tonnard. Read it and weep. I wanted to laugh but my heart said no. The book is a perfect mirror and because of that an efficient weapon. I know when I do good speeches. I know when I do bad speeches. That speech was a total home run. They loved it. Johan Velter discusses the book here (in Dutch). The book is available in the collections of Bayerische Staatsbibliothek, Columbia University, Jan Michalski Foundation for Writing and Literature, John M. Flaxman Library at the School of The Art Institute of Chicago (Joan Flasch collection), Kunstbibliothek (Berlin), MACBA (Museu d’Art Contemporani de Barcelona), Mumok Vienna, National Library of The Netherlands (Koninklijke Bibliotheek), Oxford Brookes University, and Zentralinstitut für Kunstgeschichte (Munich).